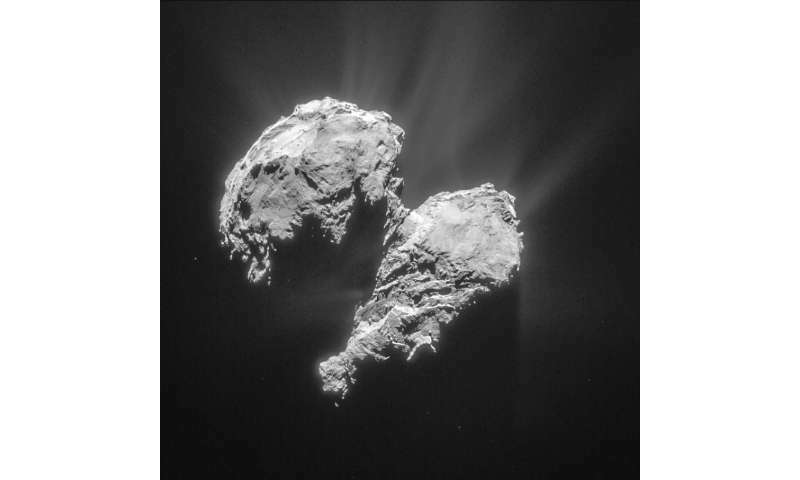 Could molecular oxygen be common on comets? 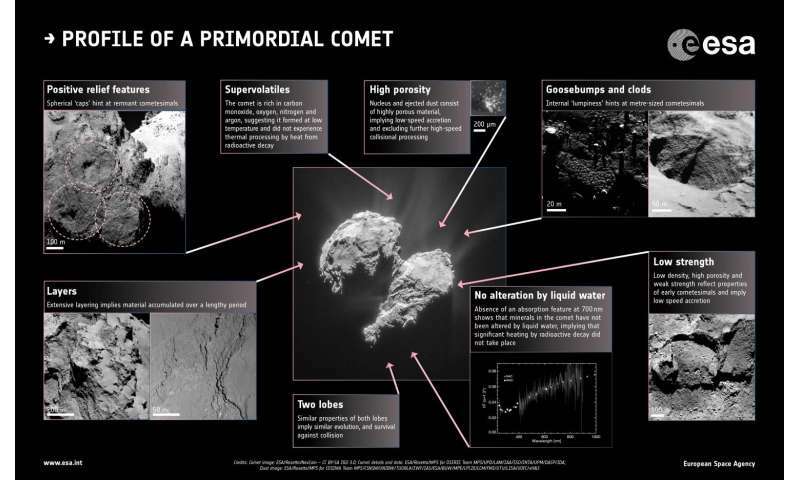 "If comets are primordial .. 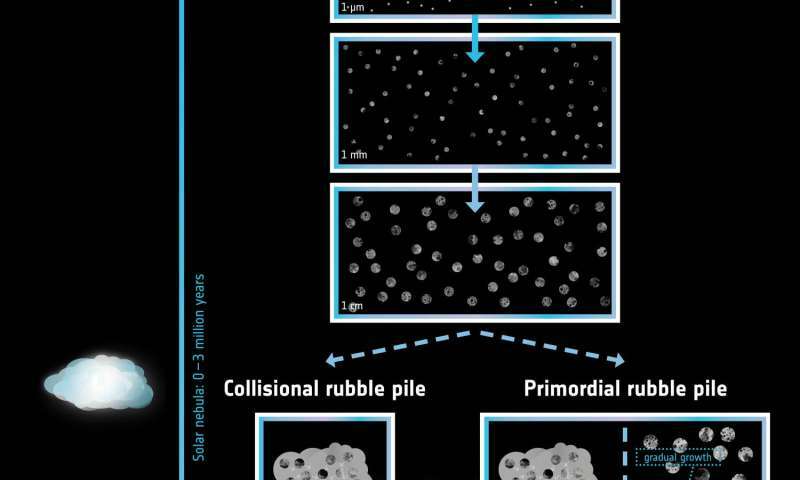 The alternative hypothesis is that they are younger fragments resulting from collisions between older 'parent' bodies .."
The substrate is not the collapse of a cloud of gas because we have a myriad of the core (Sun, planets, satellites, etc. ), if are the collisions, how explain, within collapse, the formation of a number of bodies of the same age. Therefore, the hypothesis without evidence and logic will remain only hypotheses. Did you read all 30 pages of the paper to be able to come out with that nonsense? Or just made it up on the spur of the moment? I'm not even sure what that means, so difficult to argue with it. If it was from a collapsing cloud of dust and gas (as seen around a number of stars), then the dust and gas is not going to hang around for very long, once it starts to be accreted by proto-planets. Therefore, by the time planetary formation is over, everything is going to be roughly the same age. Please explain: how the collapse of gas has no one already a million cores (they say age is the same for all)? Stupendous, another ad hoc patch to explain an unexpected observation. Nevermind that the dual-lobed structure is a common occurrence of high energy electric discharge. Nope, let us postulate the cosmic fender bender that causes two snowballs to make cosmic snowmen. I think Mr. Barnum had a quote for how easily it is to dupe the ignorant such as jonesdumb. anything from astrophysics that can validate the claim? i wonder if @24volts is gonna come along and downrate your posts and report you for your continued ad hominem posts because you can't actually provide evidence of your claims? is there anything scientific that can be validated in the comment? where is your righteous indignation for cd? Stupendous, another ad hoc patch to explain an unexpected observation. One common theme I see in the comment sections is that people don't seem to understand science. Science is the act of "patch[ing] to explain an unexpected observation," as it means your current model, while correct on some things, is evidently incomplete. If your model/theory accurately predicts other aspects but not something new, then you augment and/or patch the model so that it accurately explains the new and the old... This is how science functions and how we arrived to where we are now. So, I find this entire comment after that statement confusing. If you have a competing theory, that's great, that is what science is about... However, if that's the case, rigorously prove it via predicted and experimental results. If it accurately explains things just as well or better, it will become a competing theory. The paywalled paper doesn't say how old their primordial rubble pathway would be, but I note that the 400 Myrs era likely is set by late bombardment models while the primary body formation seems to be over in 25 Myrs. Perhaps this is another failed test of the late bombardment hypothesis, if so it follows from another putative failed test of the new Moon Imbrium observations that puts the late bombardment dating from Apollo rocks in tension. Re the anti-science trolls, I also note that the paper has some 40 expert authors and is based on several years of Rosetta observations. Against which the bloviating windbags offer nothing quantifiable touching the data at hand. A boring fail^2. @Jarrod: And the "ad hoc" claim isn't true since the models is consistent with what has gone before. It is of course the trolls attempt to criticism which is coming out of the (lightning free) blue. Ignorant? That is rich coming from you!!!! Who couldn't tell the difference between a diamagnetic cavity and a non-existent double layer. Lol. So tell us what the electrical processes are. How are they caused, what is the evidence? Where is the theory? Links, please. The paper should be showing as free access. Click on PDF option on the right hand side. Jones and Captain, thank you for correcting my mistake! Unless my hasty browsing is incorrect, the inherent time scale in their comet formation model is indeed ~ 25 Myrs (with the initial phases on the order of 1 Myrs). While the 400 Myrs is set by TNO large object models - which seems to me, but the explicit description is lacking - are scaled to the Nice model, rather old, and arguable models at that as the references admit. The point being - to me - that a Jupiter/Saturn resonance, which is the nice Nice solution to our system's architecture, could have happened before or shortly after Moon formation as regards comet formation. Comets had already formed mainly before but also (getting bi-lobed) a few tens of Myrs after the protoplanetary disk cleared. "The global shape, density and rotation of Comet 67P/Churyumov-Gerasimenko from preperihelion Rosetta/OSIRIS observations"
That's not evidence, it's wild conjecture in order to support a failed guess. No, it's from actual measurement and observation. Something you would not be familiar with as an EU cultist. As mentioned, the measurements come from a different paper, by different authors. Perhaps you could quote the relevant part of Jorda's paper that you disagree with? Deconstruct the maths regarding the spin/ precession parameters to show where they went wrong, maybe? Unless, of course, they are all part of the worldwide anti-EU conspiracy (most of them have never heard of EU, by the way) that the Grand Poobah of Science (identity cannot be revealed, on pain of death) has instigated, due to the huge threat it poses to *real* science. How are little cutesy comets born? They are not. They sadly have no mommies. Awww. Kittens are cute, but ninja cats rock! is that what your con-men told you? how many papers can you show supporting your false claim that it's conjecture? NO peer reviewed papers to help you? and you wonder why the eu is considered pseudoscience?